Since the adoption of the 7.62 × 51 mm cartridge by NATO in 1954, it has been criticised for its substantial recoil impulse, which many argued resulted in uncontrollable automatic fire from service rifles of the period. This problem was not unique to the 7.62 × 51 mm cartridge, and other full-power rifle cartridges imposed similar limitations. Even the ill-fated British Janson E.M.2. self-loading rifle, chambered for the lighter and perhaps ‘more intermediate’ .280 British (7 × 43 mm) cartridge was prone to stiff recoil in automatic fire. Contrary to their earlier stated desires, the British adopted a slightly-modified semi-automatic variant of the FN Herstal FAL as the L1A1 SLR (Self-Loading Rifle) in 1957. Chambered for the 7.62 NATO cartridge, The L1A1 SLR was considered by some to be too powerful, heavy, and long for the modern battlefield and the demands of mechanised warfare. Despite not possessing automatic fire capability, stiff recoil still inhibited rapid follow-up shots. On top of these concerns, the British Army had found that by 1970, the SLR was becoming expensive to produce and difficult to maintain. As far back as 1952, the release of two influential reports evidenced early NATO inclinations towards adopting an intermediate calibre cartridge. According to N.R. Jenzen-Jones, “the Hall and Hitchman reports concluded that small-arms fire was largely ineffective beyond 300 yards, and that the adoption of a ‘small-calibre, high-velocity’ (SCHV) cartridge would both improve hit probability within anticipated engagement ranges and significantly reduce the weight burden on the soldier”. During the 1960s, the US had already adopted their own new, lightweight service rifle and the new small-calibre, high-velocity (SCHV) 5.56 × 45 mm cartridge. The US Air Force first ordered AR-15 rifles in 1960 and formally adopted them in 1964; the US Army followed suit in 1967. M16 rifles saw widespread use during the Vietnam War, replacing most of the earlier, full-power M14 rifles. At the heart of the M16 was the new 5.56 × 45 mm M193 SCHV cartridge, derived from the Remington .223 round. Due to the smaller size and weight of the 5.56 × 45 mm, an infantry soldier could carry more than twice the amount of 5.56 × 45 mm ammunition for the same weight of 7.62 × 51 mm ammunition. Smaller-sized cartridges also meant smaller magazines, which tool up less space in load carriage gear. Much like other countries of the period, the British recognised these advantages and sought a new, lightweight and smaller-sized combat rifle chambered for a SCHV cartridge. 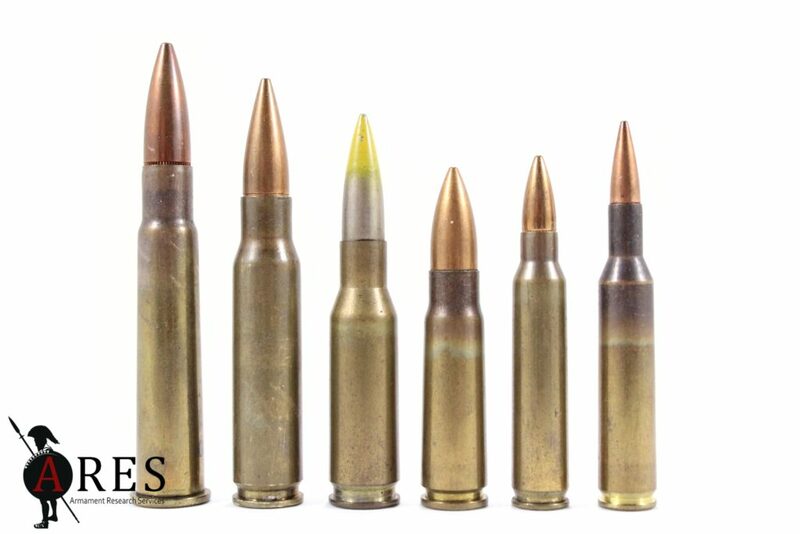 Figure 1.1 L-R: .303 British, 7.62 × 51 mm, .280/30 British, 7.62 × 39 mm, 5.56 × 45 mm, and 4.85 × 49 mm cartridges (source: Jack Dutschke/ARES). Whilst the US moving forward with their 5.56 × 45 mm M193 cartridge in the late 1960s, once again the British forged their own path, engaging in a testing programme to determine the ‘optimum’ calibre. In one of the earliest British developments, in 1969, a calibre of 6.25 mm was evaluated. .280/30 cartridge cases manufactured by Royal Ordnance Factory (ROF) Radway Green were necked down to .25 calibre, resulting in the 6.25 × 43 mm cartridge (see Figure 1.2, left). During the 6.25 experiments, at least 8 different types of ball (full metal jacket) projectiles were tested. In November 1969, 6.25 × 43 mm ammunition featuring boat-tail lead-core projectiles weighing 100 grains (6.5 grams) were demonstrated to NATO. Experiments were conducted with a Janson E.M.2. self-loading rifle and a Second World War-era Lee-Enfield No.4 rifle, both re-chambered for the 6.25 × 43 mm cartridge. Muzzle velocities of approximately 2,680 feet per second (817 meters per second) were achieved. Between October 1969 and May 1970, Enfield staff conducted independent and comparative testing of several foreign 5.56 × 45 mm rifles and those chambered for the 6.25 × 43 mm cartridge. In October of 1970, tests with 6.25 × 43 mm ammunition were discontinued, with new developments favouring a smaller 4.85 calibre (the bullet diameter was .197 in, or 5 mm). Earlier testing did inform, however, the shape of the projectile, which was carried over from the 6.25 to the 4.85 design. Figure 1.2 6.25 × 43 mm (c.1969), early 4.85 × 44 mm, and 4.85 × 49 mm cartridges (source: Jack Dutschke/ARES). Royal Ordnance Roadway Green delivered the first ammunition components for the new 5 mm calibre cartridge in February 1971. 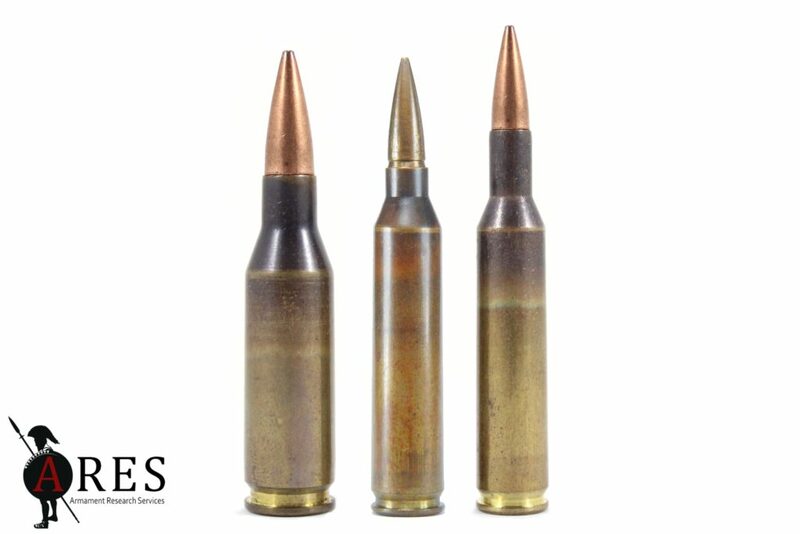 Based on the American 5.56 × 45 mm case, the cases for the new British cartridge were 44 mm in length, with necks resized down to 5 mm (see Figure 1.2, centre). The projectile was a boat-tailed lead-core design weighing 56 grains (3.6 grams), based on the earlier 6.25 mm prototypes. The cases were Berdan primed, as was typical with other British ammunition of this period. In early 1972, the nomenclature of the new 5 × 44 mm cartridge was changed. 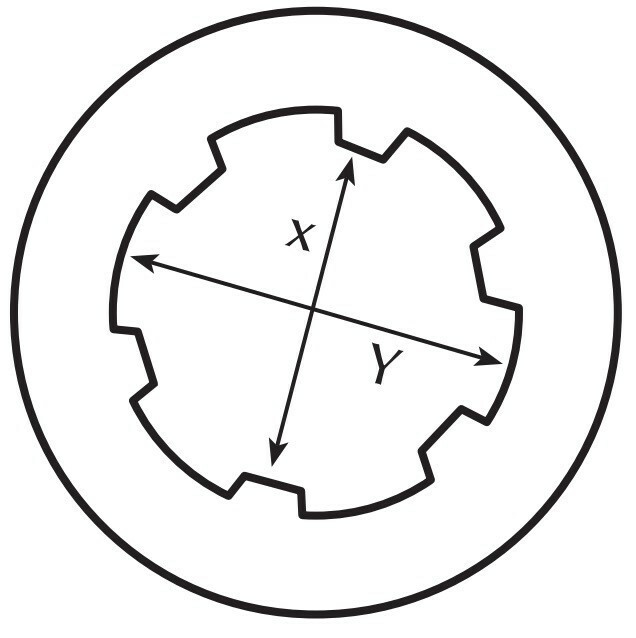 Re-designated the “4.85”, this reflected the bore diameter of the lands, rather than the grooves, of the barrels used in testing (see Figure 1.3). 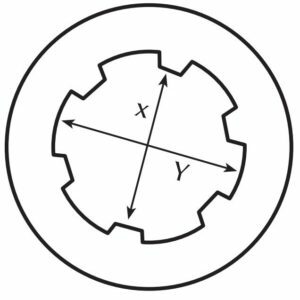 Figure 1.3 Two common measurements of calibre can be determined from the diameter of either the lands (X) or grooves (Y) of a barrel. Several other methods are also used (source: ARES). The ongoing experiments with 44 mm cases raised concerns regarding correct bullet seating due to the short neck of the case, problems with which caused accuracy issues. It was decided in August 1972 that lengthening the case by 5 mm would eliminate these concerns. However, by December 1972 – prior to ROF Radway Green’s manufacture and delivery of the 49 mm cases – Royal Small Arms Factory (RSAF) Enfield required initial pressure testing data for the 4.85 × 49 mm cartridge. To achieve this, 4.85 × 44 mm cases were used with cannelured projectiles seated 5 mm higher above the case mouth. Work on 4.85 × 44 mm cases ceased in February 1973, with prototype 4.85 × 49 mm ammunition being produced from 5.56 × 45 mm blank cases procured from FN Herstal in Belgium. Figure 1.4 4.85 × 49 mm XL1E1 ball and XL2E1 tracer cartridges (source: Jack Dutschke/ARES). In April of 1973, ROF Roadway Green delivered the first purpose-made 4.85 × 49 mm cartridges (see Figure 1.2, right). These still made use of the 56 grain (3.6 gram) projectiles tested previously, and had an overall length of 2.46 inches (62.4 mm). Early 4.85 × 49 mm cartridges were not headstamped; in fact, it appears that they remained unmarked until 1976, just two years before the production of 4.85 × 49 mm cases ceased in 1978 (see Figure 1.5). In March 1974, Enfield Design and Development finalised a 1972-74 feasibility study, and reported that the 4.85 × 49 mm cartridge met its design requirements and outperformed the penetration of 5.56 × 45 mm M193 ammunition at range, whilst offering a slightly lower recoil impulse. This feasibility study also indicated that an Individual Weapon (IW) in this calibre was to replace both the standard-issue rifle (the L1A1) and the standard-issue sub machine-gun (the L2A3). This would be supplemented by a light support weapon (LSW) which would replace the L7 general-purpose machine gun, chambered for 7.62 × 51 mm, in the light support role. The XL1E1 (ball) and XL2E1 (tracer) cartridges were produced (see Figure 1.4). Figure 1.5 Headstamps on 4.85 × 49 mm cartridges produced by ROF Radway Green in 1977. 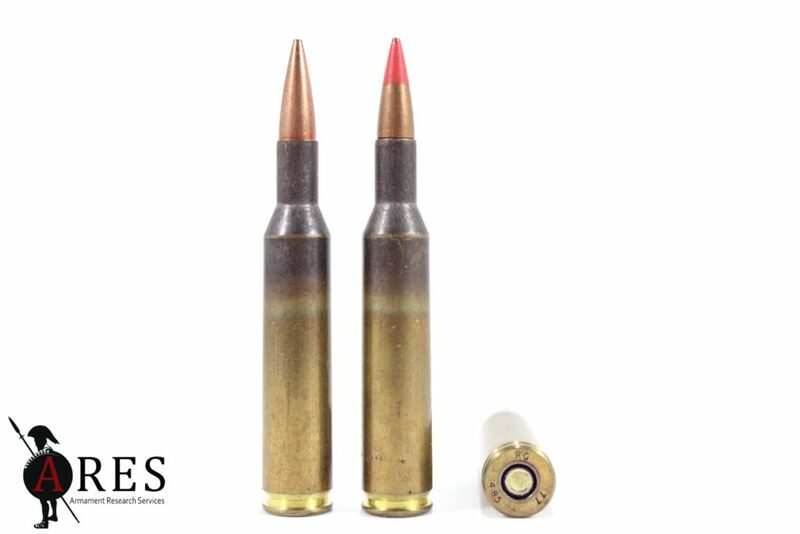 At left is the headstamp on a ball cartridge; at right, a tracer cartridge (source: Jack Dutschke/ARES). Early experiments with rifles chambered for the new 4.85 × 49 mm cartridge resulted in the ‘XL60’ series of rifles, the first generation of the ‘485 Weapon System’, the term ‘485’ taken from the cartridge calibre (see Figures 1.7 & 1.8). The 485 Weapon System later became the ‘Enfield Weapon System’ (EWS), a name used until around 1982 when the now well-known ‘Small Arms of the 1980s’ (SA80) nomenclature was adopted. In 1976, NATO signed an agreement to hold another set of standardisation trials, spurred largely by the adoption of the 5. 56 × 45 mm cartridge by several member states. The intention was to evaluate the NATO-wide adoption of an SCHV cartridge to supplement the 7.62 × 51 mm cartridge. Trials began the following year. During the 1977-1980 NATO trials, 7.62 × 51 mm ball & tracer ammunition (fired from West German Heckler & Koch G3 Rifles and Belgian FN MAG GPMGs) and 5.56 × 45 mm M193 Ball and M196 Tracer (fired from M16A1 rifles) were used as controls. Various ball and tracer candidate cartridges were submitted for NATO trials, including several 5.56 × 45 mm variations, as outlined in Table 1.1 and shown in Figure 1.6. The Netherlands, listed below, did not submit a new cartridge for consideration, instead using US-standard M193/M196 rounds. They did, however, submit Israeli-made Galil self-loading rifles designated the ‘D.MN1’. After a lengthy testing period, trials concluded in early 1979 and on 28 October 1980, NATO announced that the Belgian FN Herstal 62 gr. SS109 5.56 × 45 mm projectile loaded in a standard US 5.56 × 45 mm cartridge case to be the best of the contenders. British 4.85 × 49 mm ammunition had performed well in testing, but the second standardised small-calibre cartridge of the Atlantic alliance would be the 5.56 × 45 mm NATO round, described in ‘STANAG 4172’. The US went on to adapt their M16 rifles for the new cartridge with an SS109 projectile (designated the M855 in US service) by re-barrelling for a faster 1/7 rifling twist rate. Figure 1.6 NATO Trials candidate cartridges (source: Mancini, 1979). Whilst the British still considered the 4.85 × 49 mm cartridge to be superior, the advantage was very slight, and logistic and political pressures won over the perceived technical advantage the domestic design offered. Much like the first NATO small-calibre ammunition trials held in the 1950s, marching in step with the US offered its own advantages. Subsequently, further development of 4.85 × 49 mm ammunition came to an end, and the team developing what would become the SA80 family of small arms adapted their designs to 5.56 NATO. Figure 1.7 4.85 × 49 mm ammunition and an Enfield Weapon System (XL60 series) magazine, as fired by ARES during test-firing in early 2017. The headstamp indicates these cartridges were produced ROF Radway Green in 1976. Ball GMCS 56 gr. Purple (early) / None Purple primer annulus. Tracer GMCS 52 gr. Red Red primer annulus. At least 10 tracer types were tested. Armour Piercing GMCS Unknown N/A Tungsten carbide core; brown and blue dots on headstamp. Experimental (1973-76). Short-range Practice Plastic Unknown N/A Purple annulus (early); green stripe on case head. Proof GMCS Unknown N/A Early examples: red painted case head and extractor groove; later: CCS case & jacket. Dummy GMCS Unknown N/A Two holes in case (early, 1973-76); later with no holes. Both with empty primer pockets. Blank N/A N/A N/A Two types: brass case with plastic insert from case shoulder, and full plastic with brass head with blue paint on primer. Grenade blank N/A N/A N/A Rose crimped neck. Drill (‘inspection Inert cartridge’) Unknown N/A N/A Very few produced; nickel-plated; fluted case. Sources: IAA forums ; Jim Miles (Military Cartridges); Municion.org; ARES collection. 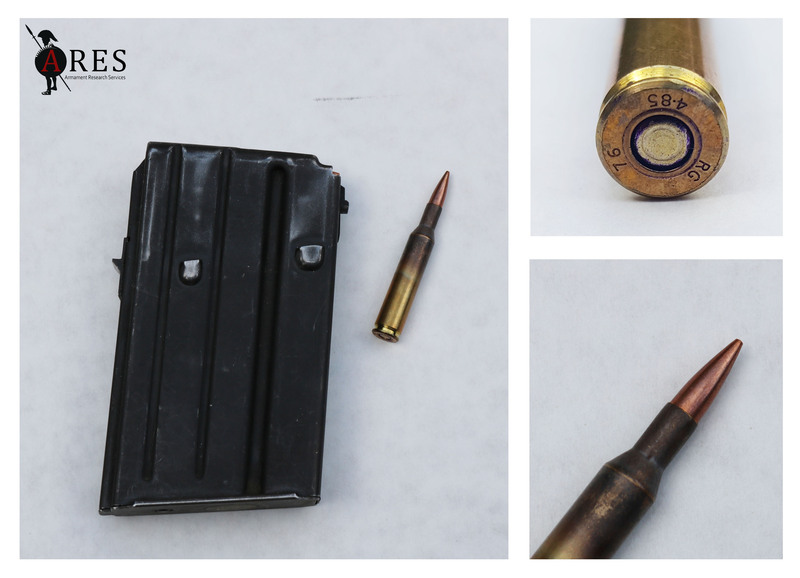 ARES had the opportunity to test-fire some 4.85 × 49 mm cartridges from an EWS IW in early 2017 (see Figure 1.8). The rounds fired were all produced by ROF Radway Green in 1976 (see Figure 1.7). Figure 1.8 ARES Director N.R. Jenzen-Jones test-firing an EWS self-loading rifle in early 2017, firing 4.85 × 49 mm cartridges produced in by ROF Radway Green in 1976 (source: Chloe Tousignant/ARES). Note to researchers: if you have further information on types, years of production, or other details regarding this cartridge, please feel free to contact us. Special thanks to Jim Miles, Winona Kennedy, and Matthieu Willemsen. Thanks also to the Defence Academy of the United Kingdom at Shrivenham, for allowing ARES to handle and fire an EWS rifle. Thanks are also due to Neil Grant for his assistance. Jack Dutschke also maintains the ‘cartridge_gram‘ Instagram account. British Army. 1976. NATO Trials Edition User Handbook for the 4.85mm Weapon System. AC 61507. Woolwich: Quality Assurance Directorate (Weapons). Mancini, Angelo N. (Jr.). 1979. ‘NATO Field Trials’. Army Research, Development, & Acquisition Magazine. May-June. Raw, Steve. 2003. 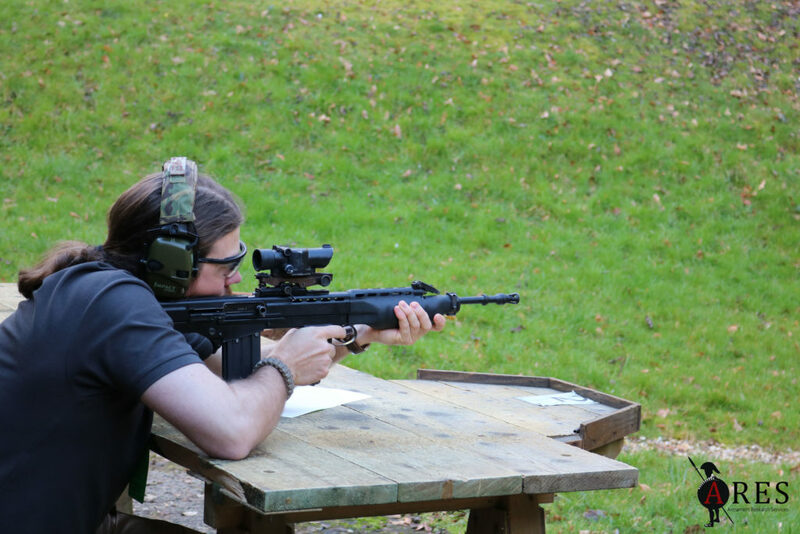 The Last Enfield: SA80 – The Reluctant Rifle. Cobourg, Ontario: Collector Grade. FWIW: Mancini’s 1979 article does not claim that the Dutch NM1 was a Stoner 63. Instead, he states that it appeared to be an IMI Galil. He was not the only author to claim this in the late 1970s. The Stoner 63’s development program was quite dead by this time with regards to its original manufacturer, Cadillac Gage. While NWM had once had a Stoner 63 license, would it still have been in effect a decade later?